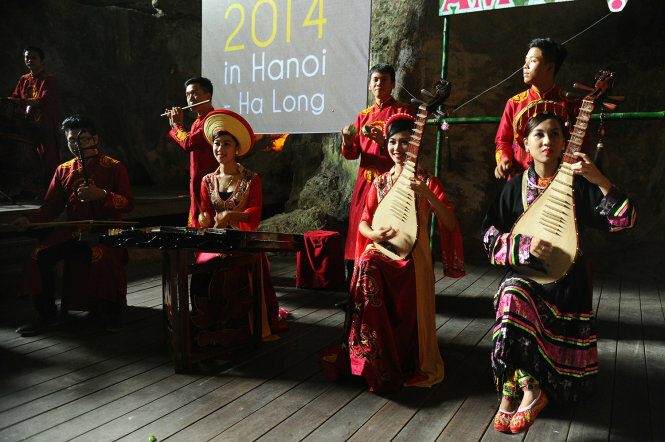 Artists are seen playing during a musical performance in UNESCO-recognized Ha Long Bay's Dau Go Cave as part of the Asia-Europe New Music Festival 2014 on October 11, 2014. Many people have articulated their concerns over the potential harm a concert held last weekend inside a cave of UNESCO-recognized Ha Long Bay may have done to the millions-year-old site, despite its marvel in terms of acoustic music. The musical performance was organized on Saturday as part of the Asia-Europe New Music Festival 2014, which ran in Hanoi and Ha Long City, the capital of the northern province of Quang Ninh, where the bay is located, from October 8 to 12. The event featured nearly 20 Vietnamese artists performing without the support of any electronic sound effects in Dau Go, one of Ha Long Bay’s most resplendent caves. The central section of the 2-million-year-old Dau Go Cave has a special structure that resembles a theater and helped perfectly resonate the music during the show, according to the organizer. However, many have voiced their concerns that the concert, which featured lit candles and an iron stage, might have done harm to the cave. Hung, a Tuoi Tre (Youth) newspaper reader, observed that tourists climbed onto the rocks for a better view and to take pictures, thus possibly destroying them. Speaking to Tuoi Tre on Tuesday, Pham Thuy Duong, head of Ha Long Bay’s management, asserted that no hi-end lighting or sound techniques were adopted for the 30-minute concert, and therefore no harm was done. As soon as the performance ended, the candles, chairs and decorative items were all cleared up, she added. But Duong still called for a seminar and even a field trip to be held to assess the extent of the damage, if any, to the cave. The 30-minute show, which featured numerous traditional Vietnamese instruments including “dan bau” (monochord zither), “flutes”, “dan ti ba” (pear-shaped lute with four strings), and “dan thap luc” (16-chord zither), delighted an audience of around 200, including foreigners. The concert awed many audience members thanks to the cave’s resplendence and the premium acoustic quality. Maria Oliynyk, a Polish tourist, who recorded the entire show with her tablet, delightedly exclaimed that it was the first time she had attended such a special concert. The event was also a chance to promote the cave and mark the 20th anniversary of UNESCO’s recognition of Ha Long Bay. “The concert in this unique setting boosts my pride for my home country’s landscapes and traditional music heritage,” said Dang Hong Anh, an expat Vietnamese audience member. The cave was also chosen to hold concerts in 2007 and 2010. Duong said that during the UNESCO World Heritage Commission’s 38th meeting in Doha, Qatar in June, Ha Long Bay was removed from the list of heritage sites recommended by UNESCO for more attention. The UN body has concerns about the surrounding areas, not the core of Ha Long Bay, she noted. Ha Long Bay has won a slew of awards and honors over the years, including the World Heritage Site title given by UNESCO in 1994 and 2000.